My one and only trade stimulator, prized piece. It's made by Mills and the image shows the "payout" card. 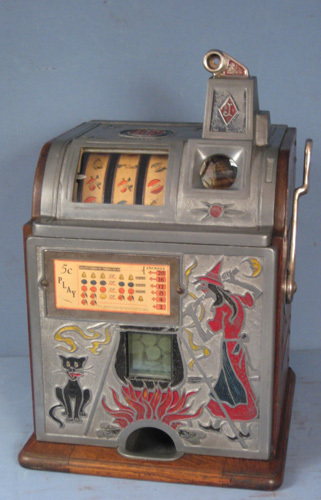 Designed for side bets, the machine can accept pennies, nickles, dimes and quarters. A gray area machine for sure. Check out the questions on the card! The reels have the answers. Yours is nicer than the ones sold at Morphy's auction. They went for $1830 & $1920. As I understand it, mine has the optional number wheel on the top, which is rarely found on these machines. You select three numbers, then pull the handle to match up with the numbers on the reels. Another layer of side-betting, far as I can see. If you should set any of the three numbers on the top AFTER the handle is pulled, there's a red bar that slips down in the number window, indicating a void selection. The engineers put a lot of thought into this machine. On the side, there's window with an old penny shown; if you push a button on the back door, the penny display slips upward, showing the last coin played in the slot. Then the cash box is separated into two sections with a sequencer wheel placing the played coins, one out of every five, into a separate compartment. Probably the operator's take.